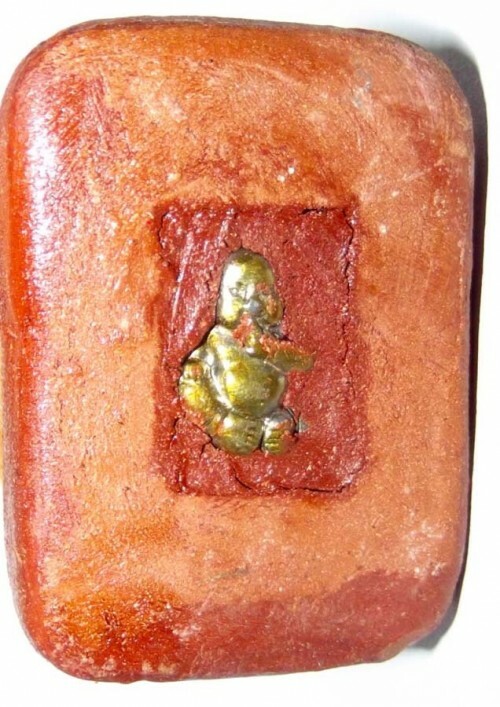 This is the final edition ever of Luang Por Goy’s now three time world famous ‘Kumarn Gao Gote’ amulets, using the sacred prai powders and ashes of nine kumarn and kumaree. This edition is even more highly awaited and fast in depletion than the previous editions, due to the fact that it is the last ever edition which will be made using this muan sarn sacred powder, which is now completely depleted and no more available for further amulets to be made. The first and second editions of Kumarn Gao Gote had such success with devotees that the first is now not only many times more the price than its original price, but is also in any case almost impossible to get hold of one, for they are all jealously guarded by their owners, who do not wish to resell them, due to their tried and tested effectiveness. The second edition has now become a source of fanatical collectorship since the issue of the third and final edition. 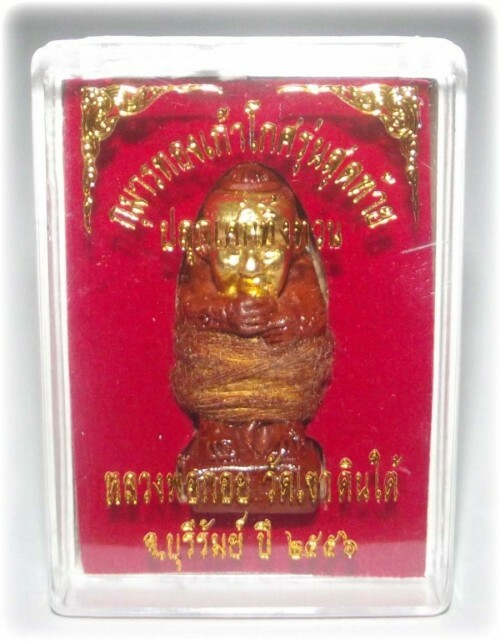 The wicha ‘Kumarn Gao Gote’ got the attention of Thai devotees many years ago as Luang Por Chern of Wat Ta Ee made some Kumarn Gao Gote, and the looksit received many successful results. This caused this particular wicha to become immensely popular as a good bet for successful results. 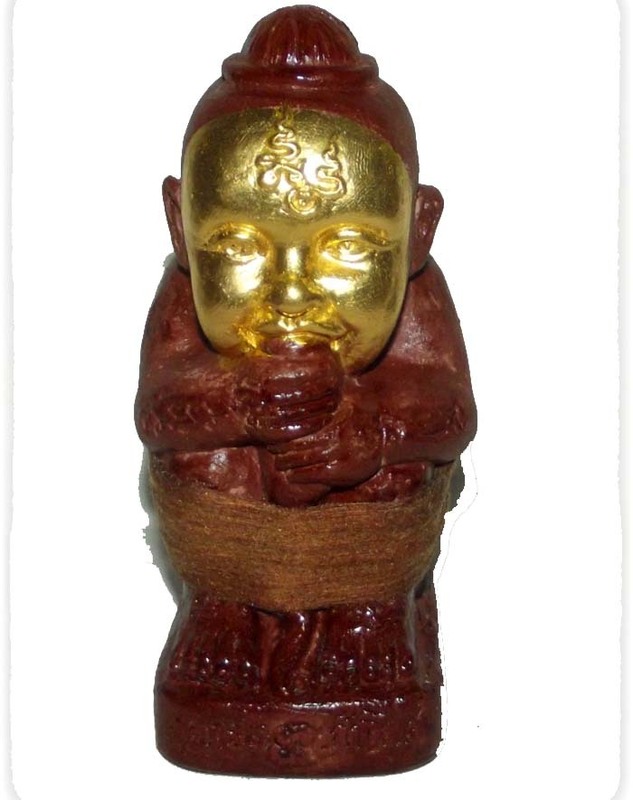 Luang Por Goy channeled his jhanic forces into the amulets using his best metta mahaniyom, maha sanaeh and maha piswaas magic to give the final edge to the amulets and lend them the extra power to assert their magic over any obstacles. 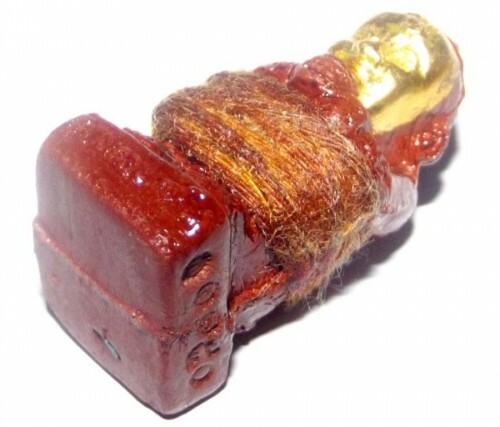 This makes the amulets useful sorcery for everything from charming your mate in life to gambling, recieving mercy from superiors or in legal affairs, stop backstabbers by converting their hate into compassion, enchant others with convincing charming speech, and to increase popularity and promote professional and social status with the mercy charm within the amulets as an aid to smooth out the wrinkles in one’s life. 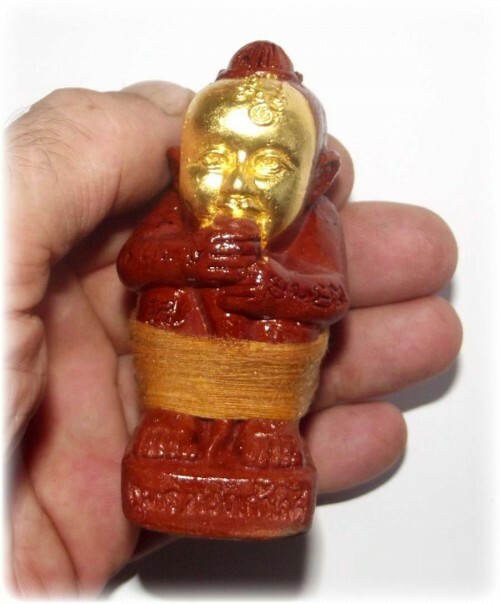 The amulets were made in small portable, medium, large, and large golden bucha size for use when out and about, or for use as a bucha statue at home. 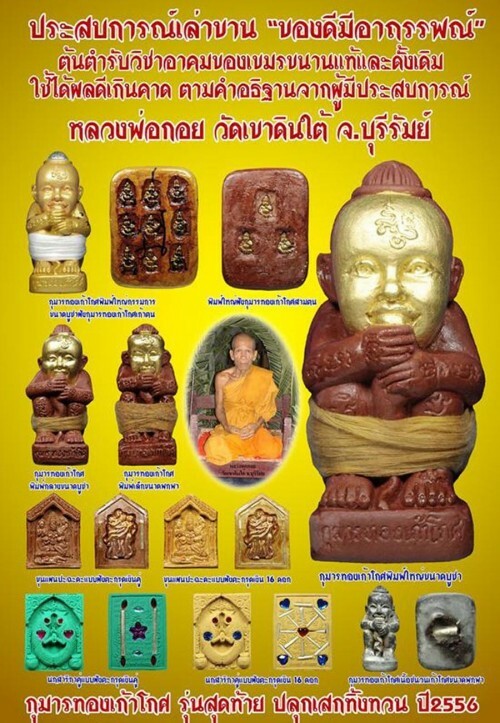 The large size bucha has three Kumarn Tong Gao Gote loi ongk statuettes inserted into the base. The large size version was accompanied by a special golden ongk kroo version which was the flagship model with nine kumarn inserted into the base. The ongk kroo was covered in gold leaf to distinguish not only its richer mixture of muan sarn powders, but also to make it easy to distinguish visually, and increase its sacred power with the gold leaf bucha blessings made upon its surface. Hence, the ongk kroo special large bucha statue is the sure collectors classic, with the fastest and highest speculative rise in chollateral value in relation to the passage of time. 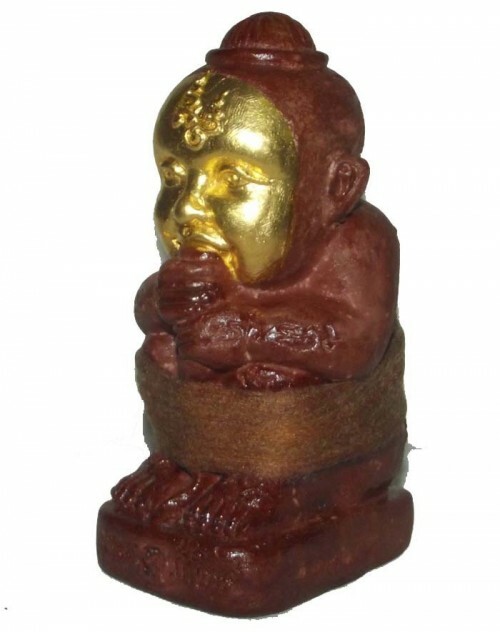 The medium and small size versions have a Kumarn Gao Gote metallic loi ongk statuette inserted into the base. 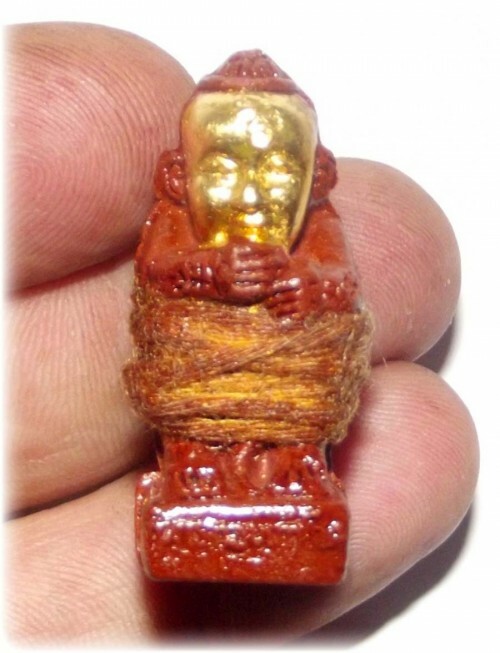 The tiny statuette is made from sacred metals resulting from the smelting together of the first and second edition of Kumarn Gao Gote amulets and muan sarn. In addition, the third edition metallic loi ongk statuettes were also smelted into the alchemical alloy, to make it not singly, not doubly, but triple strength. 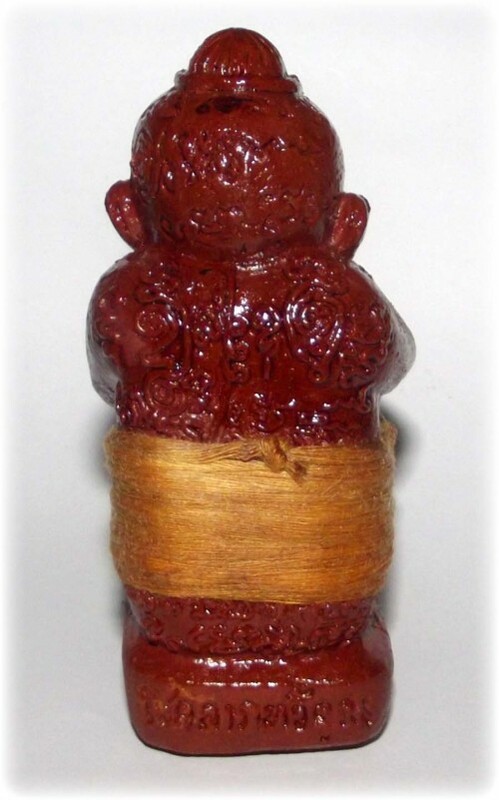 The small portable version has chanuan muan sarn in it; the medium size bucha has one Kumarn Tong Gao Gote in the base; the large bucha has three Kumarn Gao Gote inserted to the base; and in the ongk kroo large bucha there are nine Kumarn Kao Gote inserted. Nine gote (‘gosa’: pot for keeping cremation bones in; and ‘godha’: ten millions of gold) with bones from nine different children who have died in various circumstances (all circumstances fulfilling the necessary prerequisites to be prai spirits) were used to make sacred powders. This is the proper Khmer formula for this wicha. The first pot contained the bones of Nong Fon of Gumwabee who died by drowning. The second pot contained the bones of Nong Boy of Ban Pher, who was killed by a motor vehicle crashing into him. The third pot contained the bones of Nong Fai, also of Ban Pher, who died of a lung infection. The fourth pot contained the bones of Nong Hying of Ban Pher, who died of valvular heart disease. The fifth pot contained the bones of Nong Khing of Hnong Haan town, who died of malaria (Dengue Fever). The sixth pot contained the bones of Nong Maew of Paen village, who died of dysentery. The seventh pot contained bones from Nong Ham Noi, who died of pneumonia. The eighth pot contained the bones of Nong Supa of Paen village, who died of German measles. The ninth and final pot contained the bones of Nong Marie of Paen village, who died of epilepsy. All of these prai muan sarn ingredients used in the first edition were donated to Luang Por Goy by the lay master Ajarn Gam Chai, who must be thanked along with the spirits of the nine kumarn who have made merit renouncing their mortal remains for the benefit of helping those who are still living, with metta magic. The first pot contained the bones of Nong Cha Dam Yen of Ban Pher village, who committed suicide due to depression. The second pot contained the bones of Nong Ja of Ban Pher village, who was run over by a motor car and died. The third pot contained the bones of Nong Tree of Ban Pher village, who died from ascites. The fourth pot contained the bones of Nong Fon of Ban Pher village who died by drowning. The fifth pot contained the bones of Nong Koi of Ban Hnong Haan village, who died of epilepsy. The sixth pot contained the bones of Nong May of Hnong Haan village, who died of a lung infection. The seventh pot contained the bones of Nong Tern of Ban Hnong Haan village, who died of electrocution. The eighth pot contained the bones of Nong Gaem of Paen village, who died of Dengue fever. The ninth pot contained the bones of Nong Pimdta of Paen village, who died of asthma. These muan sarn ingredients were also donated by the lay master Ajarn Gam Chai, who wished to donate them to Luang Por Goy in order to increase his own merits and to make merit for the spirits of the dead kumarn in the pots, so that they can rise up to higher levels of the celestial realms in their next incarnations. The third edition used the muan sarn from the first two editions, adding even more of the last bone powders of the Kumarn and Kumaree Gao Gote to render this third and final edition the most concentrated edition of all, with 27 gote being the final number. The third edition is distinguished by the gold leaf covering on the faces, and is considered the maximum power of all three editions due to it being 9 x 9 x 9 from the 27 ghodas of prai kumarn bones. Luang Por Goy’s powerful sacred powder is visibly that which we have come to recognize as the Kumarn Gao Gote muan sarn, and recognizable as that used in the previous editions. 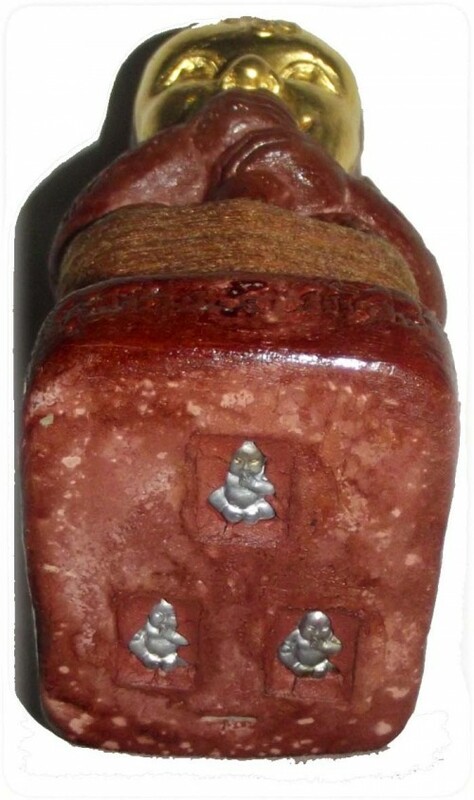 This is truly a sign of constancy and true wicha to see the muan sarn of the amulets emerge with such similarity in consistency, aroma and texture, that the composition is rigidly adherent to the strict magical formulas of ancient Khmer necromantic sorcery.